Ulloo 42 small capsule collection launches a huge statement about luxury and upcycling in a mass-produced world. Nowadays, paring down and going small is an outright act of rebellion. Behold Suzanne Currie and Lise Abraham, the maverick minds behind Ulloo 42 and the brand’s premiere capsule collection. 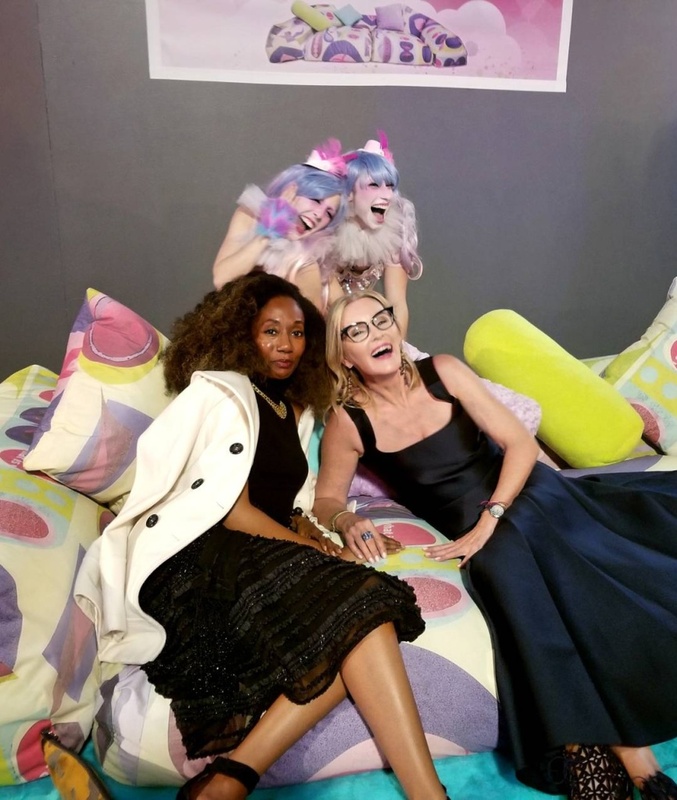 The duo launched their precise offering of one-of-a-kind furnishings in Hollywood last week at a pop-up showroom space. A quick glance displays their global aesthetic of luxury and style. There are plays on European traditional forms, vibrant African prints, plush Suzani, cotton-twill camouflage, even glam-punk exposed seams. Ulloo 42 pieces abandon the rules to craft a new sense of luxury that upholds function, art and play with equal regard. They combine sumptuous materials like Mongolian lambswool, faux mink, gilded wax, velvet and more to give pieces that might have become landfill a repurposed lease on life. The best photo bomb ever with Joy Donnell with Lise Abraham of Ulloo 42. Co-founded by artist/interior designer Suzanne Currie and Lise Abraham, Ulloo 42 is also a journey in luxury entrepreneurship. “We’re showing that you can launch something completely new at this point in our lives and careers,” states Lise. Putting her full support behind her best friend, Lise and Suzanne transformed Ms. Currie’s love of upcycling into a business. Yet, they have put so much of themselves into every detail, it seems far more personal than just business as usual. Even the name Ulloo 42 is drawn from Suzanne’s childhood in Africa and the Igbo word “ulo” meaning house. They then combined it with the number 42 because it’s various meanings in mysticism as well as literature (think Hitchhiker’s Guide and the answer to life, the universe and everything). Those who are seeking more significance as opposed to just more quantity can find a home with Ulloo 42. 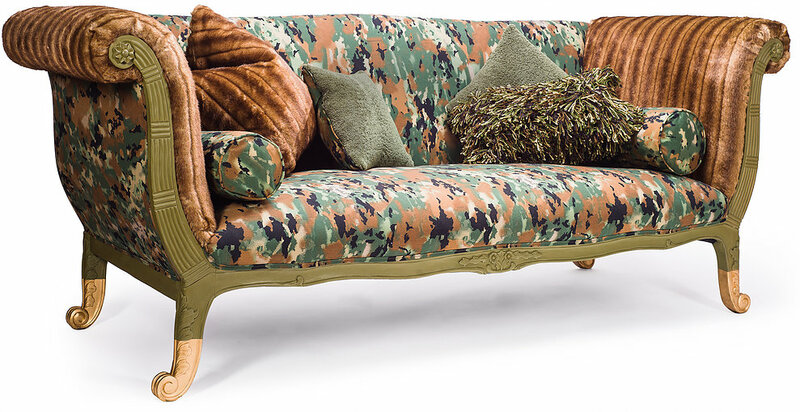 Among my favorites are the Beau Peep Chair in African pagne print fabric, the Royal Fluff Chaise in mongolian lamb, and the Lost in Place sofa in cotton twill camo. Life is too short for boring furniture. 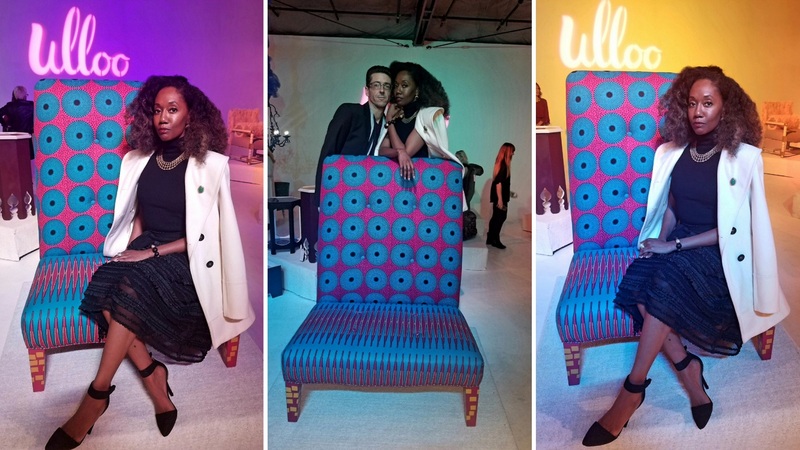 See more beauty in these Yoruba Beaded Nobility chairs.